[Above] Flower of an ornamental variety of Taro, Colocasia esculenta, (Araceae), in bloom at the Landsendt Garden, Oratia, Auckland. [Above] Crown of the Ponga, Cyathea dealbata (Cyatheaceae), showing emerging fronds. [Above] Flower of the Mānuka, Leptospermum scopariun v. scoparium (Myrtaceae). The nectar from these blossoms is the base of the most expensive honey in the world, sought after for its therapeutic as well as culinary properties. [Above] Prof Will McClatchey, Research Director, Botanical Institute of Texas, & Dr Peter Matthews, Osaka Museum of Natural History, examining one of the information "flags", 26 April 2012. [Above] Ms Seiko Furuhashi, Osaka Gakuin University, planting a fern (piupiu, Blechnum novaezelandiae), 25 August 2011. [[Above] Participants in the planning seminar examining plants of interest, 15 June 2011. [Above] Shelley Arlidge, Director of the Russell Museum, planting an Astelia in the *Fala garden, 9 May 2011. [Above] Members of the Waikato Branch of th NZ Tree Crops Association on their field trip to Te Māra Reo, 16 April 2011. [Above] Item about Te Mara Reo web site in He Muka, Māori Language Commission newsletter, after visit to the garden by Drs Jeremy Evas and Te Taka Keegan, 6th February 2011. [Above] Grover and Mari Stock, permiculturalists from California, visiting the garden with Wikuki Kingi Jr, 25 January 2011. [Above] Medina Pawley planting a kāpuka, Griselina littoralis, 10 November 2010. Above] Prof Andrew Pawley, Australian National University, planting a horipito, 10 November 2010. 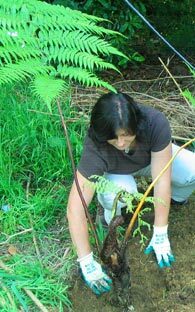 [Above] Dr Martina Buckova, Slovak Academy of Sciences, planting a mamaku (Cyathea medullaris) 10 November 2010. 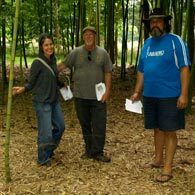 [Above] Prof Courtney Cazden, Harvard University, inspecting a new shoot of moso bamboo, 7 November 2010. [Above] A poroporo seedling among the leaf litter at the edge of the moso bamboo grove. This is where we note significant additions, alterations and developments, both to this web site and to the garden itself, and occasionally miscellaneous items of interest. These updates are organized with the most recent at the top of the page, so that a bottom-up history of the project is starting to accumulate, which you can read backwards if you start at the top. The latest news to be made available on the site is right below this paragraph. There is also a list of the pages currently being worked on at the end of the "Index to Names" page. If you want to skip the latest news and go to the short cuts to the archived items (prior to August 2018), click here. Photographs related to each item from the current news back to November 2010 are arranged sequentially on the left-hand panel. The year began much as the last one had ended, with Māori governance and the battle against the invading Phyllostachys edulis taking precedence. However, a little progress has been made on the web site -- the page on taro has been augmented by some new references and a photograph of an ornamental variety in flower (miniature in the column to the left), and a few items have in consequence been added to the bibliography. Māori governance and a few other matters, such as pushing back the invading moso bamboo, took precedence in the last quarter of the year. However, a tiny amount of progress was made, thanks to an email from John Archer, who contributes a regular column to the Wanganui Chronicle and runs a web site devoted to NZ music. At the end of his page about the chant "Pinepine te kura" there is a commentary "Kai without kai-moana", with an intriguing explanation of the hidden message in the section of the chant quoted on our page for Ponga. We have included a very brief summary of this, with a link to the original, on our web page. Serendipitously, September brought forth a new page, thanks to a request by a mānuka honey cooperative for help in countering an Australian claim that "Mānuka" was a common English word that Māori, let alone honey marketers, had no valid claim to regulate its use. Not hard to counter etymologically (see "Is Mānuka (still) a Maori word" on the new page devoted entirely to the Māori word "Mānuka", but the associated web pages required a lot of work, as most had been put up hurriedly when the site was first launched, and had not been revised since. The plants denoted by this name are dealt with separately on revised, augmented and updated pages for Kānuka (Kunzea ericoides s.l. ), Kahikātoa (NZ variants of Leptospermum scoparium s.l. ), Mānuka rauriki (Mingimingi, Leucopogon fasciculatus), and Proto-Polynesian *nukanuka. As usual, we are greatly indebted to members of the NZ Plant Conservation Network for the use of their photographs to enhance the text on these pages. I am also very grateful to Dr Peter de Lange of Unitech and Dr Jacob Jaine of Analytica Laboratories for providing me with information about the results of current research on New Zealand plants currently classified under the species name Leptospermum scoparium, and the composition of mānuka honey, respectively. January-February 2019 -- Back to current bulletin. October-December 2018 -- "Kai without kai moana" - an update to the page on ponga. September 2018 All about mānuka and mānuka honey! ~ New and revised pages. June/July 2018 One new page, updates to others, and additions to the bibliography. May 2018 Our tenth anniversary; several new pages and others updated, but retrospective commentary postponed. April 2018 Two new pages and updates to others. March 2018 Two new pages, a revision of the page for taro, and a start made on adding in sections on the use of Maori plant names in Biblical translations. February 2018 New pages, some statistics on where our readers come from (or where their computers say they are based) and what pages they are looking at. Also some notes on changes to the botanical names of ferns formerly included in the genus Blechnum. January 2018 Seven new pages, several updates, and some notes about the puriri tree. December 2017 Waitangi Tribunal, computer malfunction, invasive weeds, and a few new pages! 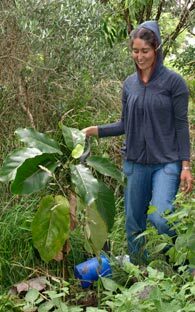 February 2016 General update / Eleven new pages / How to tell a taro from a Xanthostema / Peltate leaves / Thanks to NZ Plant Conservation Association members for more photographs. December 2015 General Update / Thanks to photographers associated with the NZ Plant Conservation Network / Links to obituary of John Sawyer, new pages, and information. March/April 2015 General Update / Links to new pages and information. 15 June 2011 "The Event!" We are still inching along, but I have had to pay most attention to organizing a book on Māori governance which I am editing with Dr Robert Joseph of the Faculty of Law at the University of Waikato, and the web site has had to take a back seat as a result. 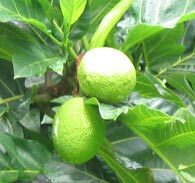 However, a few pages have had minor revisions and updates: some additional material, along with new photographs and a section on its use in Biblical translation has been added to the page on rengarenga, a relevant Samoan proverb has been included in the page for *kulu (breadfruit), and the index has been updated. And in keeping with the proverb (taken from a speech by Tui Atua Tupua Tamasese) about low-hanging breadfruit added to the *kulu page, I have also added enough information to the page for the Māori word puka, along with photographs generously provided by members of the NZ Plant Conservation Network to supplement my own, to justify its removal from the list of "Works in Progress" and incorporate it in the index. Additionally, I have also managed, right at the last minute, to write the long-intended retrospective note to mark our tenth anniversary as a virtual reality. The page for Proto-Polynesian *Pau has also at last had the photographs taken in 2015 added to it! 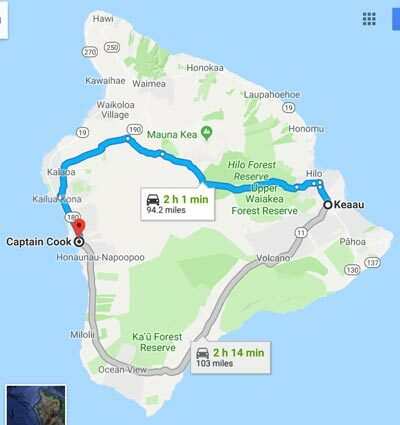 The retrospective commentary which follows is in three sections: a general overview, a description of my visit to the Any B H Greenwell Ethnobotanical Garden on the Kona coast of the Big Island of Hawai'i, and a brief concluding section. The visit to the Amy Greenwell Garden gave me tremendous encouragement for my efforts here in developing Te Māra Reo. They too have recently encountered difficulties in continuing to realize their vision; I hope that all of us will find a way through the labarynth: Ki te mea ko te Atua hei hoa mō tātou, ko wai hei whawhai ki a tātou? On 15 May 2008, a year after Nena's death, the prototype of this web site was launched. 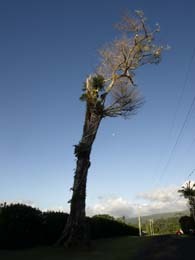 This followed three months which I had spent in Hawaii photographing trees and plants with inherited Polynesian names -- some in locations which have been obliterated by the lava flows associated with the current Kilauea eruption. During that time I also visited many private and public botanical gardens, and made extensive notes on their layout, management and plant collections. 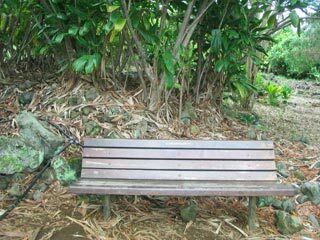 I was able to make a follow-up trip to Oahu, the Big Island and Maui in 2010, and also to the Philippines during this period, visiting gardens, talking with botanists, and doing some more plant photography. 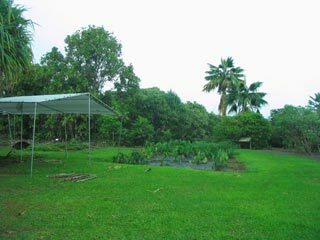 It was in 2010 that I was able to visit the garden that I found most inspiring and encouraging, the Amy Greenwell Ethnobotanical Garden on the Island of Hawaii: we will return there in due course. In the February 2009 news bulletin I outlined our "Grand Plan" for the year. 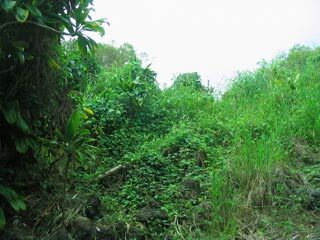 There had been a setback while I was away in Hawai'i -- some of the ongoing maintenance had been neglected and areas reclaimed from invasive weeds the year before had reverted to wilderness. I noted that we hoped to find a reliable and industrious person whom we could employ to help us remedy this situation. We did indeed find such a person, but after a year or so, the cost, added to the $35,000 we had spent the year before, proved prohibitive, and we had to rely once more on our own inadequate efforts. The grand plan also included outsourcing some of the work on the website to the Philippines; however this too proved impractical and the responsibility for planning and executing the work remained with me, as is still the case! Nonetheless while the good times lasted we did indeed make progress with the garden itself. Lurking in the background however were the moso bamboo -- a self-inflicted wound, as Nena had tried to dissuade me from planting it in the first place. However for several years after it started to become a problem we were able to keep it under control with the help of a wonderful volunteer, Mr Shine Liu, who offered his services as he said it was the finest stand of moso that he had seen anywhere in New Zealand. However it has since invaded much of the land set aside for Te Māra Reo plants and plantings. Fortunately two Chinese families have helped us keep it in check over the last two years, helping us harvest literally thousands of new shoots each Spring. We have also started a systematic campaign of poisoning, which appears to be having a positive effect (from our viewpoint). Meanwhile, the land on our northern boundary, once a constant source of gorse, blackberry and ragwort (see the news for January 2010) has now gradually become weed-free (thanks to intensive grazing), and parts of Te Māra Reo have become hosts to refugee pest plants. On the plus side, we no longer have to worry about invasion by various ruminants, as all our neighbours now seem to have secured their fences, and the work we did in this respect in 2007-8 has remained effective. Possums however continue to be a pest, but rabbits, although they have returned, are much less in evidence. The trees (except for some choked by the bamboo) and many of the ferns and other plants have thrived, bringing with them a profusion of native birds and invertibrates, including tui resident throughout the year. The grand plan for 2009 also included improvements in the layout of the web pages. These indeed were made, and further changes were implemented in 2014. Progress in preparing the pages about the plant names continues to be frustratingly slow -- a lot of time-consuming effort is required even for the elementary ones -- but the work has proceeded steadily nonetheless. At last count we had completed 72 of 123 planned pages on the Proto-Polynesian names, and 72 of 125 on their local counterparts, which is about 60% of the way to completion. Many pages however are in the basic category, but since there is always more information to be gained (and hopefully transformed into knowledge) none will ever be truly complete! Over the last few years we have had tremendous help from members of the NZ Plant Conservation Network and some other organizations who have generously allowed us to use their photographs of native and tropical plants to supplement or in lieu of those I have taken myself to illustrate new pages. 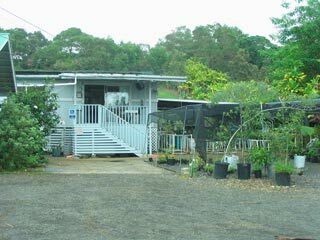 In the July 2010 notes I also mentioned a visit to the Amy Greenwell Ethnobotanical Garden. 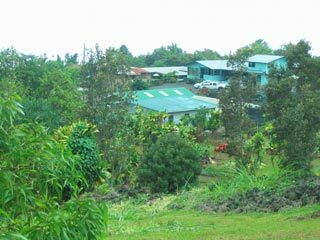 I first learned about the Amy Greenwell Ethnobotanical Garden while talking with a friend who lives in Hilo on the Big Island in Hawaii, who happened to be at the 2010 conference. The garden operated under the aegis of the Bishop Museum and seemed to have started off as a private initiative very like ours. The Director, Peter Van Dyke, was a friend of my informant, and she offered to put me in contact him when I visited the Big Island, as I intended to do before returning to New Zealand. I looked up the Amy Greenwell Garden later on the web. It seemed to be just the kind of place I needed to visit! 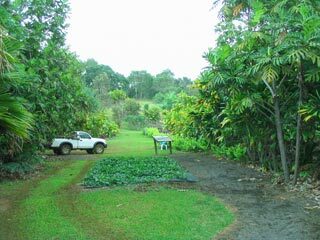 When I got to the Big Island my friend provided the introduction to Peter van Dyke, with whom I was able to talk on the phone, and arrange a visit to the Garden. My kind host, Gregory Trifonovitch, who had accompanied me previously on quests to photograph Hawaiian native plants in their natural habitats, and I set out a few days later on our hundred mile trip across the island from his home near Kea’au (close to where the latest eruptions are taking place) to the garden, located at Kealakekua near the town of Captain Cook (see the map below). What follows is taken largely verbatim from the notes I made at the time, with some explanatory notes in square brackets. The Amy Greenwell Garden was a comfortingly unprepossessing place – the entrance to ours looks much more impressive [or, it did at the time! ], and although it has lots of interesting features there is no overall guide, things are arranged fairly randomly, and all in all I could see why knowledgable visitors to Te Māra Reo, whether physical or virtual, have been so impressed. It really encouraged me to continue with our plans. The administrator, Peter van Dyke, was away in Hilo for the day, but I had a very helpful chat with Manuel, the third member of their full-time staff (the other is the botanist who looks after plant propagation). Manuel described himself as the “Garden Grunt”, basically responsible for planting, landscaping, maintenance and organizing activities. They have an office with a few selected books for sale, and a table with samples of the wood from different native trees. They raise money in different ways. Although they are owned by the Bishop Museum they don’t get a great deal of money from it. They propagate native plants, including handling bulk contracts for private and public regeneration projects. They also frequently conduct workshops on plants, conservation, various aspects of ethnobotany and so on, inviting outdide speakers as leaders. The fees for these bring in quite a lot of money. Donations are also important (there’s a box for the suggested $5 donation from visitors), and they also get educational and philanthropic organizations to sponsor visits from schools. Grants for summer interns are another important source of help. At the moment, for example, Noa Kekuewa Lincoln, a PhD student from Stanford, is there giving workshops on Hawaiian varieties of sugar cane – we could have got a complete collection of 15 varieties free if Greg was willing to grow them at his place (pity I couldn’t get a set for Te Māra Reo – they would have given them to me but there would have been no way to get them through plant quarantine). However that does give me an idea, having “partner gardens” with Te Māra Reo, where plants we’d like to grow but can’t are situated and can be seen and documented. Noa also wrote a book (which I bought) on native and Hawaiian-introduced plants in the garden [this is included in the bibliography]. They also have a lot of volunteers, some local people and other groups organized by various agencies, e.g. young people on work experience programmes who work at the gardens but are paid and supervised by a government or private social service agency. 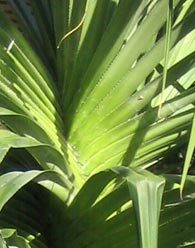 I took quite a few photos [some of which are in the gallery below], from the unprepossessing entrance to some of the labels, plants (including the hala pepe [Pleomele spp., relatives of the Dracaena and neinei], which I have not yet documented on my web pages)[now mentioned in the page for *Fala, with a picture of P. hawaiiensis there and (a different one) in the gallery below], how they put steps in their climbing paths and vistas from various parts of the garden (it’s 16 acres but feels about the same size as ours). 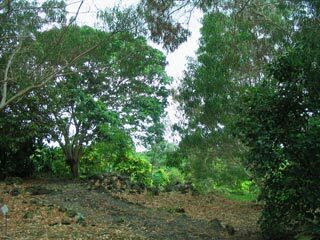 The garden is in Ahupua’a form [a traditional Hawaiian land division], a narrow slice from the top of a hill to the sea (except it’s notional in this case as development has sliced off the makai [seaward, Māori ki tai] and mauka [inland, Māori ki uta] ends of the original ahupua’a block). I climbed right up to the top edge, and photographed this because it’s overgrown with weeds and corresponds to our river boundary. We’re not the only ones with these irritations to contend with! As we were about to go we encountered a loquacious fellow, one of the local volunteers, who had an encyclopedic knowledge of sugar milling on the Island. He told us that the mill at Kea’au was the most high tech one in the US, so its closure [a few years previously] put a lot of highly skilled people out of work. I went to get a copy of Noa’s book from the bookshop (the summer intern went to get the accountant so I could actually pay), and he was still recounting tales of the cane farms to Greg when I returned. Fortunately his cell phone rang and so we were able to make a gracious escape, but he caught up with us again briefly in Captain Cook, where we had stopped to have lunch at the fabled Manago Hotel, but had to content ourselves with looking into the abandoned office/foyer, as it was 2.30 and lunch stopped at 2 [how like Aotearoa!!]. Our saccarophile friend told us we might be lucky further along, and sure enough near a shopping centre above the road, proudly flying the US, Hawaiian and local ranch flags, there was a car parked with a placard advertising Adriana’s Mexican Café “Below Supermarket”. This turned out to be little more than a taco stand, but there was a nice Chinese restaurant run by an immigrant from a village at the edge of Canton at the opposite end of the building [the Hong Kong Chinese Restaurant -- it's still there! ], and we lunched amply on honey walnut shrimp and garlic eggplant, with rice, won tons and lumpia for good measure. That’s the end of the relevant part of my notes from 2010, with a little extra information for travellers retained at the end, should you be able to visit the garden. As is probably obvious from the foregoing account, I was really inspired and encouraged by that visit, and had hoped that we could model our own garden on its Hawaiian counterpart. So far events, and especially finances, have decreed otherwise, but I have not given up hope completely. 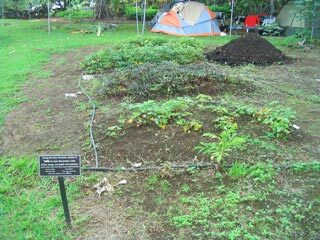 However my optimism did encounter a harsh dose of reality in May this year, when a colleague who had done archaeological research in the Amy Greenwell garden told me that the Bishop Museum had ceased funding the garden in 2016, and closed it to public access. However a group of concerned local people, determined that the project should continue, were maintaining it and negotiating an arrangement whereby it might once again be regularly open to visitors. The have organized themselves as The Friends of Amy B H Greenwell Ethnobotanical Garden, and recently revamped their web site, so clearly all is not yet lost. But the problem they are seeking to overcome underlines how difficult it is to make such ventures sustainable, even when they have strong community support. You can learn a little more about the Amy Greenwell garden in a Wikipedia page, and in addition to their web site the Friends have a Facebook page (which does not seem to have been updated since 2016) and also a Facebook group (which is probably active, since there is a link to it on the 2018 web site); however you have to be an active member of Facebook to get access to that. 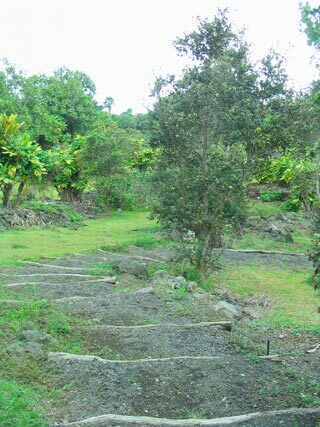 The garden is also an important archaeological site, and this has been documented in a book edited by Melinda Allen, now a Professor of Archaeology at the University of Auckland: Gardens of Lono: Archaeological Investigation at the Amy B. H. Greenwell Ethnobotanic Gardens, Kealakekua, Hawai'i, Honolulu, Bishop Museum Press, 2001, and in a paper by the same author: "Bet-hedging strategies, agricultural change, and unpredictable environments: historical development of dryland agriculture in Kona, Hawaii", Journal of Anthropological Archaeology 23, 2004, pp. 196-224. Concluding falsely from thy false assuming. As stated several times above, I have not given up on our plan to respond to Wi Kuki Kingi's challenge and transform our idea of a language garden into a living reality (Wi Kuki and his wife Tanya are the "friends" mentioned on the first line of the account of the origin of the garden, in the Whakapapa section of this web site). Indeed, despite the obstacles, much of the groundwork has been done. The plants are here, but the infrastructure is currently inadequate. Any extensive development would require many bureaucratic obstructions to be overcome. For example, the District Council told us that if we had a significant number of visitors we would have to pay at least $25,000 for a turning bay to be incorporated into the road outside the garden. However when the sociolinguistic survey I directed was completed in the 1970s, the government's social science advisors told me that funding the analysis of the results would be a waste of money. Presumably no-one would be interested. Fortunately the Director and Council of NZCER thought differently, and funding was secured from businesses and foundations to complete the work. Among many other outcomes, the survey provided important background information for the Nga Kaiwhakapumau-organized Te Reo Māori claim in 1984, which at the start also seemed a hopeless cause, but precipitated the long-delayed recognition of Māori as an official language. More recently it formed part of the evidence put before the Waitangi Tribunal in support of the Paparahi o te Raki claim. Te Māra Reo is of little consequence in comparison, but I know that in a worthhile cause persistence can indeed eventually bear fruit. Meanwhile, as the Nicaraguan poet Ruben Dario enjoins us: !Esperad, esperemos todavia! -- Tūmanako, Me tūmanako tonu tātou! Kumara garden. 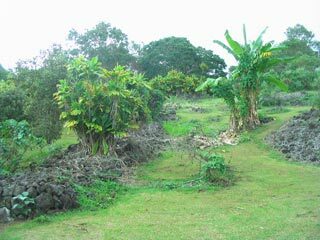 The sign reads: "Among the many Hawaiian varieties of 'uala are types that produce white, yellow, orange, and purple sweet potatoes"
The stone walls are remnants of the ancient Kona Field System, a nework of gardens that covered about 800 sq km of this part of the Kona coast. 'awa. Piper methysticum: The sign reads: "Awa root produces a powerful relaxing drink". This is the pan-Polynesian kava, related to the NZ kawakawa. and evolved from seed blown from Aotearoa. 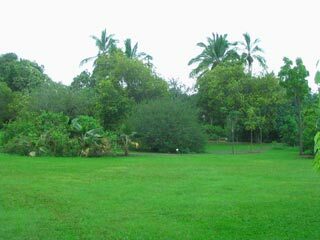 Lawn and open space, with the pervasive coconut trees visible in the background. Hala pepe, Pleomele hawaiiensis. 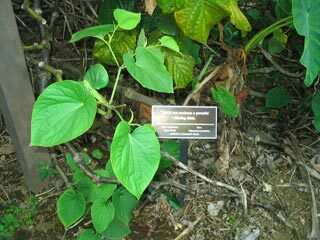 The sign for this plant reads: "The dried leaves of hala pepe were bundled to make rain capes"
Uhi, Dioscorea alata (true yam); the sign notes that this plant was a Polynesian introduction, and used for medicine as well as food. Pathway leading to upper part of garden, beyond the stepped section. Note more of the Kona Field System rock walls in the left foreground. A garden seat near the top section of the garden gives a welcome respite to the climber! The uppermost level of the Garden was overgrown and undeveloped when I visited in 2011. 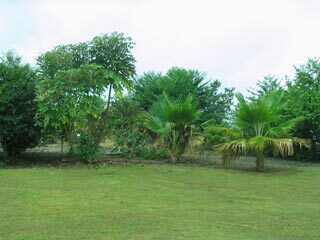 A clear space with a young koa (Acacia koa) tree on the left. A view from- near the topmost level, looking down towards the administration buildings and nursery. Another view on the way down from the top. Note the remnant of a Field System rock wall in the left foreground. More lawn and open space on the lower level..
Nursery on left; the picnic tables under the tree were being used for a sugar-cane workshop when we visited. 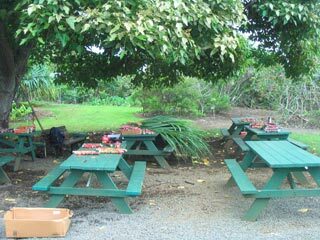 Close-up of some of the tables under the tree -- some of the sugar cane being divided for propagation is on the one in the left foreground and the one behind it. ONE PERENNIAL REQUEST! Since our change of server some time ago, we have noticed missing links on quite a few pages. Some of these are due to a mysterious and arbitrary change in code which seems to have happened at the time of the switch to a new server, but others have resulted because another site has taken down a linked page, or shifted it to a different URL. We correct these errors as we encounter them, or after they have been reported by a reader. There are probably more requiring attention. If you find a link that doesn't work (or takes you to the wrong place), or notice that a photograph is missing, please let us know: temaarareo at gmail.com, or kupu at temarareo.org. These months have come and gone with a further slowing-down of activity, alas, and Matariki 2018 has passed without my having completed that ten-year "retrospective commentary" mentioned in the notes for May. August perhaps will see that idea become a reality! Nonetheless, we did finish one new page, on ngaio (incorporating both the Māori and Eastern Polynesian versions of that word), thanks to a query from Robert Vennell of the Auckland Museum. Revisions were also made to the pages for Māori poroporo (including a new section on poro kaiwhiri, the pigeonwood (Hedycarya arborea) and Proto-Polynesian *polo, along with the pages combining Eastern Polynesian *taraire, Proto-Polynesian *talo, and Proto-Polynesian *kaualiki respectively and their Māori reflexes. A few new references were also added to the bibliography. 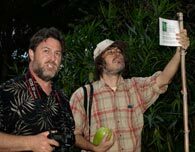 We are grateful Mike Thorsen, Jeremy Rolfe, Peter de Lange, and John Barkla, of the NZ Plant Conservation Network, along with Kim and Forrest Starr of Starr Environmental in Hawaii, for permission to use their photographs. This month we celebrated the tenth anniversary of the launch of this website (in prototype form), on May 15th 2008. I had intended to write a retrospective commentary to mark that occasion, but alas other concerns have had to take priority. Look for it some time in June, as a prelude to Matariki! However we have completed some new pages, on māhoe (Māori and Hawaiian versions), hinahina / *sinasina (likewise), taraire (Māori and Eastern Polynesian referents), Māori kōwhai, and Proto-Polynesian *kōfai. Minor revisions have also been made to the pages for whara, aka, and Proto-Polynesian *kaualiki, and a cross-reference to rangiora (a name originating in Aotearoa, alternating with pukapuka) has been added to the index page. As always, we are grateful to members of the NZ Plant Conservation Network, this month Mike Thorsen, Jeremy Rolfe, Peter de Lange, Gillian Crowcroft, John Barkla, Wayne Bennett, and the late John Sawyer, together with Kim and Forrest Starr of Starr Environmental in Hawaii, and "Bogdan", a contributor to the Wikipedia public domain website, for permission to use their photographs. The work on updating pages and removing bugs has continued, with further work on the page for taro, substantial revision of the page for aute, and missing links restored to the page for maikaika. 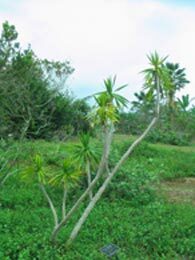 The pages for ongaonga, ramarama, and Proto-Polynesian maile have all been revised and information and examples added about the use of the words to designate plants mentioned in the Bible. Two completely new pages mean that the backlog from what was planned in 2016 has now been cleared: these are the pages for Proto-Polynesian *tala-qa-moa and its Māori cognate taramoa. 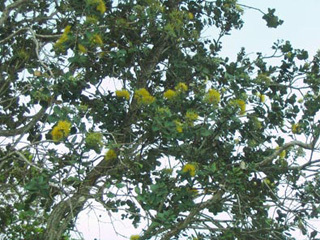 A section has been included on the use of the Maori word as a substitute plant name for a variety of thorny and prickly plants mentioned in the Bible. We are once again grateful to members of the NZ Plant Conservation Network, this month Mike Wilcox, Jeremy Rolfe, Mike Thorsen, John Barkla and Wayne Bennett, also to Kim and Forrest Starr of Starr Environmental in Hawaii, and the contributors to the public domain websites from which some other illustrations have been drawn, for permission to use their photographs. The page for kauri has been updated, and a new section added on the use of kauri as a plant name in the Bible. An enquiry from Hawaii was the stimulus for a thorough revision of the page about taro. The text has been greatly augmented, the photographs have been enlarged, the format has been updated from the 2011 to the post-2014 style, and a new section has been added about how the word has been used in the Māori translation of the Bible. 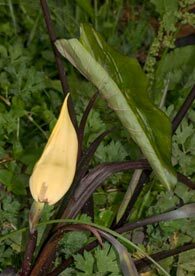 Although taro is only one of more than a dozen Māori plant names to appear in Te Paipera Tapu, it is unique in both its frequency (over 400 appearances), and in the scope of its use. Further progress has been made in clearing the backlog from 2016, with the addition of pages for Proto-Polynesian *poa (a variety of yam) and its Māori cognate poapoa, the New Zealand jasmine, Personsia heterophylla. Once again we are grateful to members of the NZ Plant Conservation Network, in this case Jeremy Rolfe, Mike Thorsen and Wayne Bennett, for permission to use their photographs. Nau mai ki te Tau o te Kurī. And perhaps also the Year of the Pūriri, if the Ngapuhi groups can agree to combine their forces and negotiate a satisfactory settlement with the Crown. 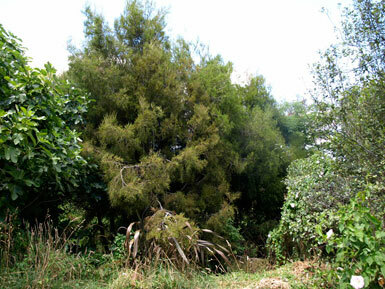 If not, perhaps it will be te tau o te mokoroa instead -- see the new page on the Pūriri, a very important tree albeit without a verified tropical Polynesian name, for more information. Some more analytics: Last year the top 5 countries with identified visitors were Aotearoa (66%), The United States (11%), Australia (3%), China (2%), and the United Kingdom (1.3%). So far this year the first three have retained their rankings, with the United Kingdom and India in joint 4th place (1.5% each). Mobile phones continue to gain on desk tops, up to 38% (to desktops 55%) by the end of this month. Te Rā o Waitangi ~ Waitangi Day 2018. I have been looking at Google Analytics and have discovered that, among other things, this page is read relatively often; over the last year it was 9th most accessed overall, and so far this year, perhaps because there is at last likely to be some recent news in it, it has jumped to 4th. The most popular page, apart from the home page, has been and remains the page for the Māori word poroporo. Why this should be is something of a mystery, but it has been top of the list month after month for years. Other consistently popular pages have been those for kauri, whara, aute, and taro (Proto-Polynesian *talo), along with the general introduction, and those on the history and evolution of the plant names. The top 10 or 12 pages account for about two-thirds of the visits; we are hoping that a more frequently updated news page may encourage more exploration. Last year 62% of the visits were via desktop computers; so far this year this has dropped to 57%, with mobile phones jumping from 31% to 36%, and tablets steady on about 7%. Fortunately most of the pages prepared from 2014 on are fairly mobile-friendly, but some of the earlier pages may not be so easy to read on a mobile phone. We are slowly shifting these to the new format, but it will be quite a while before we can finish this "migration". Please bear with us in the meantime! From time to time new research results in a change to botanical names for one or more of the species included in these pages. In the past we have simply corrected these in the entries for the plants concerned, but from now on we will announce the changes in these news bulletins, as some very old-established Latin generic names are being consigned to oblivion, and when updated the entries on this web site will have a name quite different from those in many dictionaries and plant lists. The latest changes result from work on the ferns in the Blechnum family (Blechnaceae). Those included in Te Māra Reo are on the pages for *piu and piupiu -- Blechnum procerum becomes Parablechnum procerum, B. novaezelandiae becomes Parablechnum novaezelandiae, and B. discolor becomes Lomaria discolor. 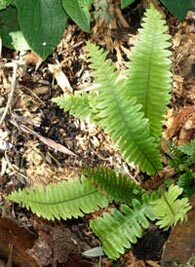 The other fern in this group affected is listed at present only on the index page: the former Blechnum fluvatile (kiwa) becomes Cranfillia fluvatile. Seven more pages from the 11 waiting in the wings at the beginning of 2016 have now been added: those for Proto Tahitic *raupo, and its Māori reflexes raupō and raupō taranga, along with Proto Nuclear Polynesian **kiekie and **aka, and their Māori counterparts kiekie and aka, respectively. We	are	thus now well over half way to catching up, in a manner of speaking. These precipitated seven more linked pages which are now up in minimalist format (see the list in the preamble to this page, above). The index page has been updated, some additions made to the bibliography, and the missing photographs and associated links have been added to the Evolution page. 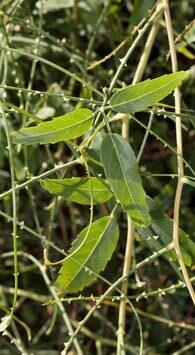 We recently had an enquiry from someone interested in the origin of the name pūriri, the tree known botanically as Vitex lucens. There isn't a page for the pūriri yet, but its alternative name, kauere, is on the list. The name "Pūriri" seems to have originated here in Aotearoa, and applies exclusively to the pūriri. The tree does feature in several proverbs, in several different guises. My giving it an etymology at present would be pure guesswork, but in subsequent correspondence some interesting metaphorical leads (which we'll follow up) have been suggested. The other name is used on the East Coast, and it's quite possible that its use pre-dates that of the name Pūriri. Some linguists link it to the Rarotongan word auere. Its presence on the East Coast would give some plausibility to the Rarotongan link, but the only thing that the plant of that name has in common with the Pūriri would seem to be its dark-coloured berry. 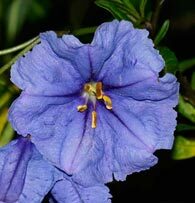 (The Rarotongan auere is a tropical shrub, Grewia crenata, related to the houhere -- as possibly also is the Rarotongan name, because I've seen it recorded by a reliable source as au'ere.) So in its kauere guise the Pūriri might possibly have linguistic links to Rarotonga (although this is doubtful), but as Pūriri it seems definitely to be home grown! We began 2016 with great ambitions, which seemed well on track in February, with 13 new pages added to the site and half a dozen more in an advanced state of preparation. Then the world outside the garden intervened, in the form of Te Paparahi o te Raki -- the Waitangi Tribunal hearings on the claims of several northern hapū and iwi or which expert opinions on issues connected with language policy had to be prepared by the person responsible for most of the web pages. That took up a good chunk of 2016, and then an expensive component of the computer failed, and it was not until near the end of 2017 that we have been able to afford to replace it. Keeping the invasive plants, especially the moso bamboo, under control has also consumed a great deal of time, money, and the fading energy of the chief gardener. Fortunately other family members and friends have helped greatly in the battle with the unwanted herbage, and also supplied the expertise to get the computer system up and running again once the vital component was obtained. Two of the 11 pages still in preparation in February last year have at last been added to the site and the index, along with one other. They are those for Proto-Polynesian *kofe and its counterparts in Aotearoa, kohe and kohekohe (jointly), along with another "twin" page, for Proto Central Eastern Polynesian *kākaso and its Māori reflex kākaho. The first two contain also a lot of information about words originally referring to varieties and uses of bamboo, many of which found their way to Aotearoa even though the bamboo did not. This was partly inspired by our ongoing struggle with the moso bamboo, and the visit of members of the NZ Bamboo Society to Te Māra Reo for their Spring 2017 meeting. 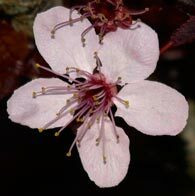 A paragraph has been added to the introduction to the name index page pointing out that some of the plants in addition to their generic names had a large number of terms relating to varieties and uses associated with them. Chief among these are the breadfruit (Proto-Polynesian *kulu), taro (Proto Polynesian *talo), bamboo (Proto-Polynesian *kofe, from which Maori kohe originated), and kumara (Proto Eastern Polynesian *kumala). The history of many such words which are plant-related but not always plant names is recorded on those and other pages. Amendments have been made to some pages, a few more broken links repaired, and many new pages are in preparation. The first of these were ready for transfer at the end of this month and have now (early March) been transferred. These pages are in various stages of completeness, but all have the essential botanical information, many have a little additional information, and some have pictures. It takes quite a while to prepare a page as all the information has to be checked, including botanical names which are occasionally out of date in some key sources, and photographs sourced and prepared for the web. And then there is the narrative to add, often from many pages of notes. Rather than keep delaying until everything planned for a page has been completed, I have decided that the common-sense approach is to work towards getting get the basics attended to for all the words in our lists, and then go back and fill in the details later. The 13 pages added in this batch are those for ongaonga (Proto-Polynesian *hongohongo); whau and whauwhau (Proto-Polynesian *fau); houhere (Proto-Polynesian *fausele); kohe (Proto-Polynesian *kofe); māota (including Proto-Polynesian *maqota); kōhia (no direct Proto-Polynesian counterpart, but possible links to Proto-Polynesian *kofekofe); and ramarama (Proto-Polynesian *lama). There are 11 more now in preparation. We remain deeply indebted to the members of the NZ Plant Conservation Network who have generously allowed us to use their photographs, and in some cases supplied unpublished ones to fill some gaps. In addition to those people mentioned in the news for December 2015, Mike Thorsen has given us permission to use his photographs; one appears in the page for ongaonga (link above). Additional material will be added to pages designated to be "under construction" when the opportunity arises, but priority will be given to producing pages with the botanical information for all the names on our list that are not yet represented on the site. However, please let us know if you would like information added to an existing page, or a currently absent page to be added, ahead of schedule. We'll try to oblige! For those who have read the question at the end of the page about *talo (taro), if you look carefully at the photographs you will see that the leaf stalks of the Xanthosoma plants are attached right at the point of the "V" indentation on the leaf. 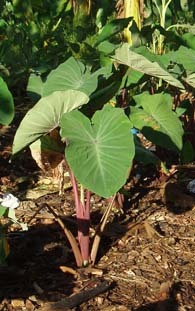 The true taro (Colocasia esculenta) leaves are attached nearer the middle, a little way below the "V". The technical term for this is "peltate", from the Latin word "pelta", a crescent-shaped shield. Peltate leaves, like those of the Colocasia, are attached near the middle, between the upper and lower margins; the Xanthosoma leaves are non-peltate. I'm grateful to Dr Peter Matthews for identifying the Xanthosoma pictures from my collection of photographs of plants I have encountered in the Philippines. A lot of research and some exploration (in Aotearoa and Samoa) has been done since the last update, with about a dozen new pages in preparation and others revised. We hope to have the new pages finished soon. Meanwhile we are very grateful to have permission from a number of members of the NZ Plant Conservation Network to use their photographs on pages where we do not have enough or any suitable photographs of our own. These have been incorporated in many of the pages in preparation, and in the revised (and considerably expanded) pages for *fara, whara (including harakeke), and wharawhara, and cognate words, which are now up on the web. These people all have our grateful thanks: Wayne Bennett, Jonathan Boow, Jesse Bythell, Gillian Crowcroft, Peter de Lange, Jeremy Rolfe, and the late John Sawyer. We were saddened by the news of John's sudden death on 6 November, and extend our condolences to his family and friends. 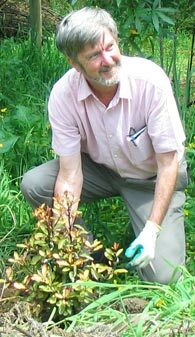 There is an obituary on the NZ Plant Conservation Network's website, outlining John's remarkable contribution to the conservation and knowledge of NZ native plants during the twenty years he lived in New Zealand; this including being one of the co-founders of the NZ Plant Conservation Network -- an organization which we would urge anyone interested in NZ native plants to join by becoming a member. A few minor adjustments have been made since the last major update of the site in August last year, and one major change -- a new home page (the old one is now a "read more" page linked to the revamped one), along with a quick time-travel page, also linked to the home page, based on the brochure prepared a few years ago for visitors to the tangible garden. New plant pages have been added, many in draft form so that the essential information will be available on the site more promptly. It often takes a long time to assemble the photographs and obtain and check the information included in the longer entries, so we have decided to start routinely putting up pages when we have the linguistic information and some basic information about the plants, rather than delay sometimes for months until a more complete version is ready. The new pages put up on April 10th are for Māori Hangehange, Hīnau, Makomako, and Maire, Proto-Polynesian *Hange, *Mako, and *Maile, and combined Māori/Proto-Polynesian (*)Aute (including *kaute, *siapo, matahiapo, *malo, and maro), (*)Mairehau, (*)Manapau, and (*)Pau. Two more pages feature locally created and acquired names, Koromiko and Ōriwa. August 2014 has been an exciting month for the web site. We have now completed our 100th on-line "name" page, with nine new pages bringing to 49 the number of pages devoted to Proto-Polynesian names, the plants they denoted, along with plants bearing reflexes of those names in some modern Polynesian languages, and 53 devoted to the plants bearing Maori names derived from earlier stages in the evolution of the language. Not yet half way -- still another 153 to go (unless more names or plant references are discovered! ), but getting there. At long last the pages on the web site can be accessed directly through the "temarareo.org" address. We are also slowly editing older pages and converting them into a modified format including the pull-down menu for getting to other parts of the site, and which also happens to be reasonably mobile-friendly. New pages are also starting to appear-- the latest are those for Proto-Polynesian *Malili, *Tawa, *Lewa, and *Kulu, and their Māori reflexes Māriri, Tawa, Tawāpou, Rewarewa, and Kuru. Substantial revisions have also been made to the page for Māori Poroporo and the explanation of the use of the Chinese characters 德馨 on some pages. All these pages and 12 others have been transferred to the new format with the pull-down menu and more accessible page design. A few have only basic linguistic information at the moment; we hope to prepare more of these in the near future, to fill the complete gaps in our documentation. The garden itself has suffered from the recent frosts, and we are still uncertain as to the long-term future of the physical garden. 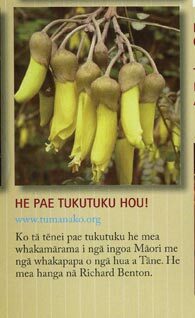 However the virtual garden may well grow more luxuriantly; once we have the Māori names covered, we may include some more Samoan and Hawaiian reflexes that are not paralleled here as part of a wider garden of Tāne mā. Meanwhile I have been able to spend a few days in Samoa, and photograph a few of the plants which do share their names with counterparts in Aotearoa. 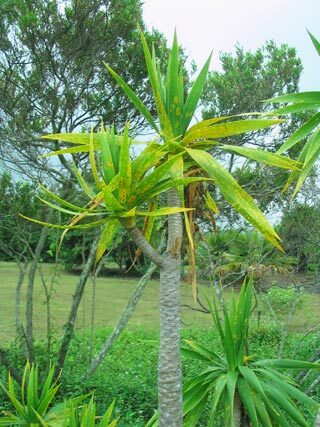 Many plant names have come to Aotearoa via Samoa, and several dozen probably originated there. On a recent visit to Samoa I was able to photograph two Mālili (Terminalia richii), a very tall forest tree, native to Samoa and now critically endangered, one in the botanical garden and another on the side of a road, dramatically catching the last rays of the sun. The name of this tree may be related to the Māori word māriri "the unripe fruit of the tawa" (another tall forest tree), derived from Proto Nuclear Polynesian *malili "unripe or withered fruit" -- there is a well-established Samoan cognate reflex from this source, malili (short initial vowel), used when fruit falls before maturing. We am very grateful for HH Tui Atua Tupua Tamasese Taifi Efi for making this visit possible, and to Galumalemana Steven Percival for his help in locating the mālili and other significant plants and for facilitating a brief but very productive visit to the Botanical Gardens. 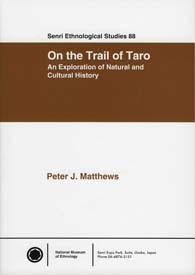 We have recently also received a copy of the book On the Trail of Taro: An Exploration of Natural and Cultural History by Dr Peter Matthews, a New Zealander who is a world authority on taro and has visited Te Māra Reo. It has just been published by the National Museum of Ethnology in Osaka, Japan. It is a fascinating story replete with scientific data of the cultivation of taro and its spread by horticulturalists from Nepal on the one hand and Yunan, China on the other, in prehistoric times, reaching New Zealand from the Pacific in the early years of Maori settlement. However, the original strains have over the last two centuries been partly replaced by introduced varieties from China and elsewhere, although the older varieties also remained in cultivation. 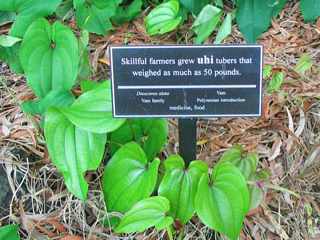 Taro is a very resilient plant, and both older and more recently introduced varieties may be found in the wild as well as in gardens. It is horrifying to note that it is over two years since this page was updated. There are two reasons for this. Firstly, we have been in the process of updating many pages while at the same time shifting the site to a new server, and this has taken longer and produced more complications than we anticipated. Most of those difficulties have now been surmounted, however, and when you see this the new pages will have been loaded. There may well be some bits missing and other adjustments needed, so if you spot something apparently amiss, please let us know. Secondly, the future of the garden itself is in doubt, as without an adequate income the venture is rapidly becoming unsustainable. However, we have decided that even if we have to abandon the physical garden, the digital one will be retained, so this site will continue to grow! Some of the highlights for the last two or three years are summarized retrospectively below (with illustrations in the left-hand panel). More information, both old and new, will be added from time to time, at much shorter intervals than in the recent past! On April 26 we were honoured by a visit from Dr Peter Matthews of the Osaka Natural History Museum, a world authority on taro, and Professor Will McClatchey, the Director of Research at the Botanical Research Institute of Texas. Professor McClatchey, a distinguished ethnobotanist, was very helpful to us in making contacts and advancing our research when he was Professor of Botany at the University of Hawaii, and has remained a good friend of Te Māra Reo in his new capacity. On August 25 Ms Seiko Furuhashi from Osaka Gakuin University, Japan, visited Te Māra Reo. 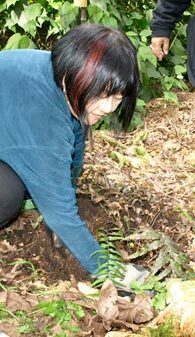 While she was here she was able to add to the fern collection by planting a specimen of Blechnum novaezelandiae in the section allocated to those collectively known as piupiu. On 15 June we held a seminar to discuss current plans and future possibilities for the garden with individuals and representatives of groups interested in native flora and ecological and environmental issues. The all-day seminar generated some very useful ideas, and we greatly regret that we have not been able to secure the resources needed to follow through on many of them. On May 9 Ms Shelley Arlidge, Director of the Russell Museum, visited Te Māra Reo to discuss the ideas behind the garden and plans for its development. 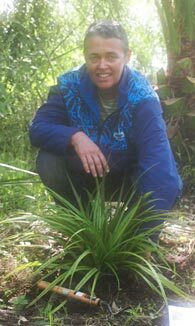 She planted a specimen of Astelia fragrans (wharawhara) in the hexagonal "*fala" enclosure near the main gate. Members of the Waikato Branch of the New Zealand Tree Crops Association held a field day at "Tumanako" on 16th April 2011. Members had come to look at the fruit trees planted on the property, and also to tour the language garden. The event was reported in The Waikato and Thames/Coromandel Branches, New Zealand Tree Crops Association, Newsletter June 2011, pages 4 to 5, reproduced below. On a dripping wet Saturday, tree crop enthusiasts numbering 19 braved the elements, dodged the V8's noise and traffic in Hamilton, and met at Richard Benton's 2 hectare property on the outskirts of Ngarauwahia. During the past 14 years of Benton family ownership, the use of the land has completely changed from an almost bare paddock with a row of 110 pine trees (now mostly gone) to a mixed forest of native and food bearing trees. 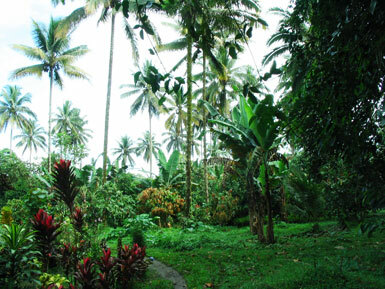 After a welcoming cuppa, Benton handed each of his visitors a leaflet outlining the stages of his "language garden" and an accompanying map of the intended 800 m winding tour of the property, arranged to simulate a trip around many Pacific islands. He then guided his visitors along the paths conducting them on the imaginary journey starting from Taiwan 5000 years ago, when Polynesian peoples began to spread across the Pacific. On the way, Benton, with his particular interest in Pacific languages, explained the concept that the names of New Zealand's native trees as we now know them, have developed down the centuries even millennia from the names of earlier, similar plants in different locations in the Pacific. In line with this concept Benton selected a dozen "stages" or places within his forest, to pause and note a particular tree and to point out the specific links. 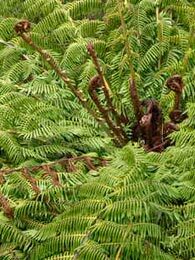 These includes those with familiar names such as kauri, kahikatea, totara, pohutukawa and manuka and others not so well-known. 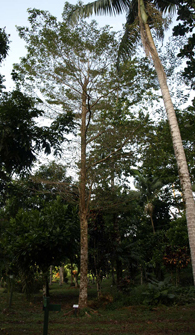 Interspersed throughout Benton's forest are almost 50 planted kauris, now 12 years old and handsomely tall. We heard that the round kauri cones are female and pointed cones are male – news to some. The kauri does not have flowers. Male and female cones grow on the same tree, with a male cone emitting pollen. Scattered among Benton's native trees are fruit and nut trees, including many kinds of olives although only one olive variety ears fruit and the Waikato – the koroneiki. Numerous figs were bearing, of note the tiny but sweet black mission variety. Figs and grapes grow well at this location. 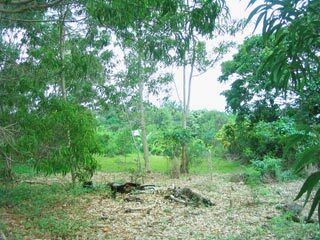 Near the front of the property as a grove of large moso bamboo, with mature (four-year-old) bamboo stalks at least 100 mm in diameter. Bamboo is notorious for growing out of control, but Benton is fortunate that an Asian person, aware of both its potential and its needs, noticed it, remarked that it was the best stand he had seen in New Zealand and offered to tend it. 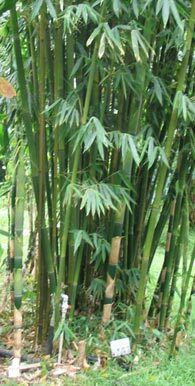 He gathers the young shoots for eating, trims the roots, and as a result the stand is attractive and not at all like a common bamboo thicket. The strong bamboo can be used to certain types of construction provided is not left in the ground (where it rots). Benton has a plastic greenhouse made with bamboo stalks on Waratah posts. 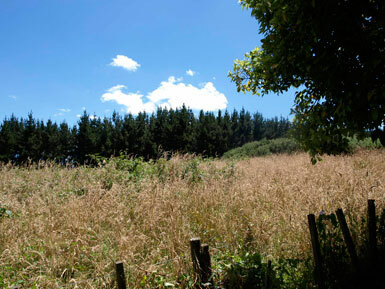 On the property are one or two patches of hollow ground called borrow pits, having survived since Maori ownership. In days gone by they were used to provide course of gravel or other components to improve and warm up the soil elsewhere, where kumara were grown, perhaps across the adjacent Waikato River. Other points of interest on the way included a bunyabunya tree, a Queensland kauri, a large Pinus pinea that will hopefully produce pine nuts, and the Hawaiian calabash gourd displaying one large gourd in progress. Near the end of the journey the "tourists" refreshed themselves delightfully by munching on different varieties of ripe apples picked straight from the trees. The visit was strongly educational, botany being intertwined with linguistics, history, and geography, all served on an imaginary sea voyage around the Pacific. We were delighted to welcome Dr Te Taka Keegan of the Computer Science Department at the University of Waikato and Dr Jeremy Evas, Director of Terminology and Policy, Welsh Language Board, who visited the garden on Waitangi Day. They came to discuss language revitalization policy and practice, and enjoyed the tour of Te Māra Reo while engaged in this task. There is a report on Dr Evas's visit to Aotearoa in Te Muka, the newsletter of the Māori Language Commission, Vol 24, No. 1, with photographs taken while he and Dr Keegan were with us. Two visitors from California, Grover and Mari Stock, visited the garden with Wi Kuki Kingi, Jr, from Kirikiriroa Marae, Hamilton. Mari, originally from Costa Rica, and Grover were visiting New Zealand in connection with their work on sustainable land use and related matters. 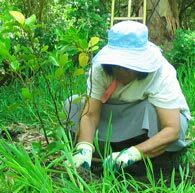 While they were here Mari planted a puka tree on the northern end of the "Nga Tamariki o Te Hapuku" fern garden. It was Wi Kuki who challenged us to "do it ourselves" when our ideas for a language garden in Manukau City were scotched by the developers of a new town centre. On 10 November 2010 we hosted Professor Andrew Pawley of the Research School of Asian and Pacific Studies, Australian National University, Canberra, his wife Medina, and Dr Martina Buckova, an anthropologist specializing in folk lore at the Slovakian Academy of Sciences, Bratislava. We had just started working on a section of the garden reserved specially for the children of Te Hapuku (tree ferns). After their tour of the garden, Martina was able to plant one of our newly-acquired mamaku there, and Medina and Andrew planted a kāpuka and horopito respectively along the border of this area. The 7th of November was the first of two major changeover days planned for this site: the launching of the revised versions of the key pages incorporating new headers with built in menus. Before long (we hope) this will be followed by transfer of the whole site to a new server, which will mean that all the pages will have URLs commencing "www.temarareo.org/" rather than the present much more complicated addresses [this is still "work in progress @ August 23rd]. The revision of the pages seemed to be taking an interminable time, so it is a great relief to have completed it. It should make the site much easier to get around, and the information on it easier to find. These pages have also been livened up by a lot more photographs and icons. There is a guide to the site as a whole (and the garden) in the new "Finding Your Way / Hōparatanga" Section. On the new pages we have also abandoned the "Māori" fonts, which we had used on the ones they replace -- instead, we have specified the fonts as Arial, Geneva or generic sans serif, with inbuilt macronized characters. The older pages, including all those dealing with plants and plant names written before November 2010, are still in the old format and incorporate Times New Roman Māori and Arial Māori fonts. We had a visit from Emeritus Professor Courtney Cazden from Harvard University in September. She was very taken with the moso bamboo (see picture at left), through which the walk to beginning of the "Time Travel" journey usually begins. 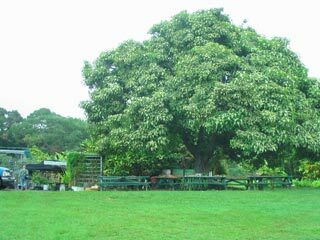 This plant grows naturally in the mountains of Taiwan and so the moso grove is a good imaginary encounter with the cradle of the Austronesian languages. Two words for large bamboos have been reconstructed for Proto-Austronesian: *betung (Proto-Oceanic *botung), and *qauR, unchanged in Proto-Oceanic. The first didn't make it into the Pacific; *qaur got as far as Vanuatu and New Caledonia, and its reflexes are also found as a generic word for "large-stemmed bamboo" in many Indonesian languages. Had it reached this part of the world, it would be au in Māori. (It is remotely possible, but I suspect unlikely, that au in the sense of a pin holding a mat as an item of clothing is an echo of *qaur, as this was certainly one of the many uses of bamboo in the tropics.) The new shoot which Professor Cazden is standing beside is now a culm about 8 metres tall -- they can reach 24 metres, so ours still have a way to go! I was very pleased to discover when reading the October newsletter of the Waikato Botanical Society that we have at least one "declining" species of native plant actually flourishing here, but I was also disconcerted to realize that we had not been treating it with due deference! The plant concerned is the northern Poroporo, Solanum aviculare, which according to an article in the October 2010 Waikato Botanical Society's Newsletter is apparently rare in the Waikato and thought by some botanists to be a "declining species". Here in Te Māra Reo it is certainly not declining -- from two original plants we brought here from Auckland via Wellington it has been carried literally from one end of the 2 hectare block to the other. 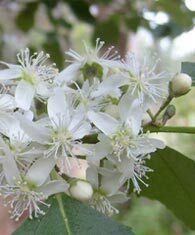 We like the tree -- it has attractive foliage, beautiful flowers, provides shelter and shade for smaller plants, and (because it's rather frost-tender) is an excellent indicator of where the warmer microclimates are to be found -- so we have generally left seedlings unmolested. It's also very fast growing, and we planted some along part of our boundary with a neighbour, to replace the pine trees we had felled. However, the first thing some local people we hired to clear along the boundary did a couple of years ago was to demolish unbidden every poroporo they encountered. 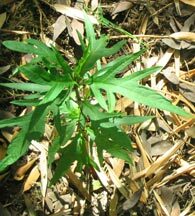 This was not part of the plan (they regarded it as a weed), but we would have been a little more perturbed if we had realized that the way the plant was flourishing here was not the norm! Finally, while in Hawaii in July and on a short visit to the Australian National University in September, and with the help of colleagues in Australia, Japan and the US, I have been doing some research on the migration history of taro, both the plant and the word. This will be reported in the page for taro when I have time to write up the results of these investigations. R.B. Even more water has fallen from the heavens since the last update, but there have also been a few frosts, mostly while I was in Hawaii doing some more research, although fortunately those have not been nearly as destructive as the ones we had a couple of years ago. Perhaps warming is accompanying climate change, after all, or some of the more tender plants are becoming hardier! Over the last four months revisions have been made to the introductory, acknowledgements, biographical, index, locations and contact pages. We are planning a change in the formatting of the site which will make the main menu accessible from all new pages and from existing ones as they are revised, as well as improving the overall page layout. This should be in train by the time of the next update, but don't hold your breath! New pages have been added or revisions made for 10 Proto-Polynesian names: *halufe, *mamaku, *kumala, *kaualiki, *kava, *kiwa, *mafoe, *manono, *taraire, and *fapuku. Nine new Maori-name pages corresponding to some of these (or others) have also been completed: kawa, kawariki, kiwakiwa, mahoe, puka, rangiora, taraire, mamaku and wheki. The report of the Waikato Botanical Society's visit at the end of February has also been made accessible from the site, as well as our brief "time travel" guide for visitors. While in Hawaii I visited the Amy Greenwell Ethnobotanical Garden on the island of Hawaii, and got some very good ideas from the way they run things (this is a formerly private garden owned by the Bishop Museum, but largely dependent on private funding and the help of volunteers to keep it going), some which I hope to implement in Te Mära Reo as the opportunity arises. A lot of water flowed from the heavens in January and up to the middle of February, but in the month since then only 10 mm has fallen. However, the fifty-odd seedling trees we planted out in January and early February are faring well, although we have given a few that were looking a bit jaded some water over the last couple of weeks. Despite the drought, some qantum leaps forward have been made. 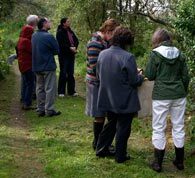 We had a visit from the Waikato Botanical Society on February 27, which enabled us to inaugurate the "Time Travel" tour -- this seemed to interest everyone who took part. We were lucky to have had a visitor from Canada, Mr Noel Francisco, who did the walk a couple of weeks earlier. This allowed us to have a very helpful trial run. Another visitor, Mr Matthew King, shot 11 rabbits and a possum, which was also greatly appreciated. Eleven new pages have been added to the web site since January 15: six Proto-names (*renga, *piu, *ponga, *feki, *lata, & *kisi); four Mäori names (rengarenga, piupiu, ponga, & kokihi), and a page about how the plants are (or will be) identified with "cylinder" and "flag" labels (this is linked to the "Finding your way around the garden" page). These signs are now in place for all the significant plants included in the "Time Travel" series, and a few others. We have bought a laminating machine and are printing the labels ourselves, which has cut the cost of preparing the signs by about 80%. Minor and sometimes major revisions have been made to many other pages on the web site, and further work on the plant names not yet dealt with is under way. The biggest headache right now is not the lack of water, but the absence of an inward cash flow :). It's been quite a while since the last update, and money is still a problem, but fortunately we are not quite bankrupt yet (although somewhat too many thousands of dollars poorer), and it's invasions of rabbits and weeds that are the major problem as I write -- I'll include a couple of photographs with this update to give you an idea as to why! Although there's still a lot of work yet to be done, we are now just past the one-third mark in getting at least minimally informative pages (and some that actually are much better than that) up on the website. As of last night (January 14, 2010), there were 74 "plant name" pages on the web -- 36, covering 47 of the 136 proto-names we have identified, and 38 dealing with 54 of the 144 Maori names (and 91 of the 228 species included in those names). New names, especially new Maori names, are still being encountered, and the figures generally exclude reduplicated forms (but do include affixed forms), so the totals are close approximations rather than 100% accurate! But on any of these measures, we are a great deal further along than we were six months ago. Also there's another important breakthrough -- you can now do some time travel around the garden, covering 6,000 years of the history of the Maori language while walking 750 metres or sitting comfortably at your computer; there's a link on the "finding your way around" page. We have not had a serious invasion of ruminants for some months, and the new sheep-fencing right along the east, west and southern boundaries should provide security there, especially along the riverbank (western end), where animals from unfenced neighbouring properties often come up when the river is low. We wanted to completely replant the riverbank with native plants, especially species relevant to the language garden, but after a whole herd of yearlings rampaged through there and did quite a bit of damage to newly-planted trees elsewhere the garden a few months ago (before we had finished the fencing) we have had to give up on that idea for the moment. Because the land on our northern boundary hasn't been used since then I decided to forgo for the moment the expense of re-fencing the 250 metres left to do there and trust that the ad-hoc repairs we and the owners have made sporadically will hold if cattle are put back there. Meanwhile, as you can see in the photograph below, that neighboring property is a haven for blackberries and gorse, along with rabbits, a little discouraging as we battle with them on our side of the fence, but in this part of the world c'est la vie! Just for interest, I've put underneath a "this side/that side" pair of photographs which I took on one edge of my cousins-in-law's farm in South Cotabato, Philippines, in October 2008, looking out to the chemically-fertilized and chemical insecticide-treated Dole pineapple plantation, and in to their 80 hectares of wholly organic orchard using only biological and organic pest control and fertilizing. View across the boundary to the north - blackberry in middle ground, gorse right background; the tree in the top right is in Te Māra Reo [15 Jan. 2010]. View from same spot, looking south (Te Māra Reo) -- Kahikatea and harakeke in centre, fig tree to left, Tawhiwhi (Pittosporum tenuifolium) right foreground. 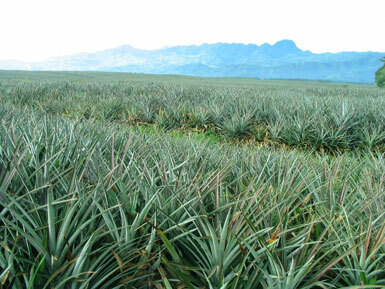 View from boundary of Kablon Farm, South Cotabato, Mindanao, Philippines -- looking across the surrounding Dole plantation -- monocrop pineapples. 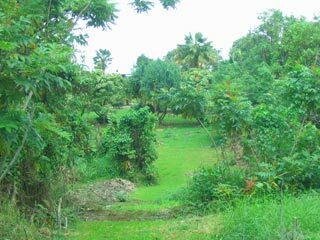 View from same spot, looking into the wholly organic Kablon Farm, with intercropping of coconuts, pepper, cacao, papaya, other trees and herbs [22 Oct 2008]. Well, it's now been a year since this site was first put up, and progress has been rather slow, but it probably will be ready to go quietly public a few months from now, when a few more of the pages about names and the plants they refer to are up. So far 16, 8 historical and 8 contemporary, have seen the light of day, which is fairly glacial progress. However, this should be speeded up soon as more "proto-pages" are produced -- that is, instead of delaying until I have lots of information prepared in web format, I'll try to discipline myself to be satisfied with the basics, and just fill in the blanks later, as anyone who really wants to follow something up can probably find plenty of information elsewhere on the web. There are also 17 other pages on the site (with general information, descriptions of areas of the garden, etc. ), so there's already plenty to read. Well, almost nine months have gone by since the core pages were put on line, and nothing had been reported on this page since, although a few things had been done -- new web pages, alas, were not among them. But fittingly, since today would have been Nena's 69th birthday, in the last few days five more pages have been produced: the pages for the heritage word kauri and its Proto Nuclear Polynesian source *kauli, and the profiles of areas 2, 46 and 56, as well as an expansion of the description of area 29, and the addition of the new areas to the interactive location map. A number of new names and species were also added to the on-line list in the months in between, and a few new species have been added to the collection in the garden - although from where I sit typing this I can see about 100 plants which I obtained before I left for a couple of months in the Philippines in October 2008, and which still have not been planted. Meanwhile an embarrassing number of people around the world have expressed enthusiastic interest in the garden, so doing nothing or abandoning the project is no longer an option! We do have a severe labour problem, as James has been ill for much of the past year and unable to do much labopuring work. I have put in several hours a day when I have been in New Zealand, but relatively long absences at critical periods (e.g. October-December 2008) have meant that, because systematic maintenance has not been possible in my absence, the jungle of weeds has grown up again and the heritage plants have been engulfed once more. We did hire some local workers during the winter and spring, but this was an expensive exercise and although it enabled the southern boundary to be cleared about a metre out from the fenceline, the area around the riverbank completely cleared of unwanted herbage on the surface (a major undertaking, but many of the weeds have since grown back, because there has been no follow-up) and some reinforced fencing put up to lessen the danger of invasion by animals from neighbouring properties - a perennial problem - maintenance of areas cleared the previous year for planting was not carried out, and part of these areas has been overrun by blackberry now 2 metres high! So the $8,150 paid out for these services simply secured the garden from large ruminants, but did little to maintain existing plantings let alone prepare the way for new ones. We spent $1,175 purchasing new plants, but, as noted above, only a few have been planted. A further $1,815 was spent on supplies explicitly for the language garden. When you add these up and include the $25,000 odd we paid for tree felling the previous year, you can see why finance is also a concern. Nonetheless I am planning to try to find some reliable and reasonably industrious person whom we could employ for a day a week over the coming year to enable us to get rid of the really noxious weeds (blackberry, and to a lesser extent tradescantia and convolvulus are the really menacing ones) and keep them from reappearing by mowing regularly, mulching and so on. I'll organize future planting along the margins of already planted areas, as these can be prepared for expansion, so that things move out from various centres, rather than trying to colonize completely new locations. Most importantly, I'll try to maintain the momentum with the documentation, starting with the basics so a lot of pages can go up and be expanded later, rather than trying to exhaustively research each tree and word, taking weeks or months to get a page ready. I'm also going to "outsource" some of the work involved to the Philippines (like our Telecom company with its call centres), not because it's cheaper (I don't pay myself for doing it now :-)), but because processing and resizing each photograph or calculating the correct ratio of pixels takes so long to do -- if I could just select the photos I want (which takes long enough, given the disorganization of my files) and get someone else to do this tedious work, things would be speeded up enormously. It might possibly be expanded to include putting in all the links and testing these, another vital but time-consuming activity. That's the grand plan for 2009. By the end of the year perhaps we can "go public" and solicit donations from admirers with a clear conscience, economic downturns notwithstanding -- they won't affect eccentric millionaires! (Widows' mites will also be very acceptable, provided they don't have legs.) So, watch the space above this one for news of our progress. This is the first anniversary of Nena's death, and also the day on which the core pages (including this one) were all on the web for initial perusal and checking by family and friends -- so, the launch day for the advanced prototype.